As the creator and producer of all three CSI franchised shows, Anthony E. Zuiker needs no introduction. However, in addition to being an accomplished television producer, he’s also an accomplished author. 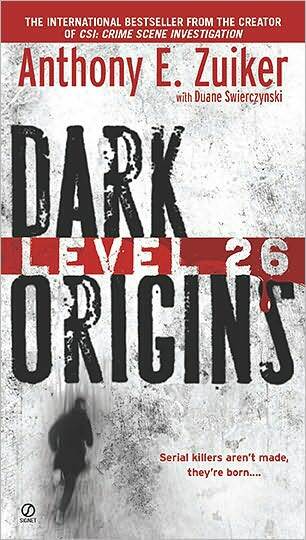 His novel, Level 26: Dark Origins, is a diginovel--a novel with an accompanying website that mirrors the events of the novel. Every few chapters, readers can use a special code to log in and view scenes from the novel, see evidence, watch security camera tapes, and even receive voice and text messages from characters. While this concept isn’t new, Zuiker’s Level 26: Dark Origins takes it to a new, and extremely professional, level with professional, celebrity actors on board, including contortionist Daniel Browning Smith as the terrifying Sqweegel. According to most law enforcement personnel, murders can be categorized on a scale from one to twenty-five, with one being the most naïve or reactionary beginner and twenty-five being organized sociopaths who premeditate their kills and torture their victims for pleasure. Steve Dark is forced into leading an operative team sent to track Sqweegel, the only human being to every be categorized as a Level 26 murder. However, Steve Dark has a different life. He abandoned crime fighting to become a real person, with a wife and child on the way. What make Sqweegel more terrifying, more psychotic, is that he knows this, and texts Sibby, Steve’s wife, on a regular basis. When Sibby is in an accident, Sqweegel manages to kidnap her from the hospital and deliver the baby on his own, constantly taunting Steve Dark with this intimate access to his wife, child and personal life, daring Dark to chase Sqweegel ever closer into a madness of his own creation. Zuiker has taken the crime drama to a new level, creating a text too extreme for television, then augmenting that nightmare with online videos and interactions. These online performances also become a bit extreme, and should be avoided by squeamish readers; however, the idea of Zuiker’s diginovel and the professionalism with which it was executed is exciting, providing something thrilling and new for even the most dedicated of horror and crime readers. Joshua Gage is an ornery curmudgeon from Cleveland. His first full-length collection, "breaths", is available from VanZeno Press. Intrinsic Night, a collaborative project he wrote with J. E. Stanley, was recently published by Sam’s Dot Publishing. He is a graduate of the Low Residency MFA Program in Creative Writing at Naropa University. He has a penchant for Pendleton shirts, rye whiskey and any poem strong enough to yank the breath out of his lungs. He stomps around Cleveland in a purple bathrobe where he hosts the monthly Deep Cleveland Poetry hour and enjoys the beer at Brew Kettle.